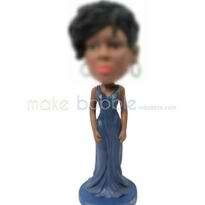 Custom blue dress bobbleheads - a love more than a gift! Formal clothes for women can create a sense of elegance and grace for both young and older women and one bound to attract attention and admiration. To have a permanent reminder of your outstanding appearance at the formal event, why not choose one of our formal dress Bobbleheads? In years to come, you will be able to look back with pride to see how truly wonderful you were.